Today, I have a very special interview in store for you guys with Kristen-Paige Madonia, the author of Fingerprints of You. I emailed Ms. Madonia back in March to tell her how excited I was about her debut novel (which releases TOMORROW!) after reading the first chapter. As you guys may know, contemporary novels are not really my thing. However, her beautiful writing and fascinating characters were so addictive that I just had to tell her. Anyways, Ms. Madonia is probably one of the sweetest people I have ever spoken with online, and she was kind enough to allow me to interview her for you guys. I hope you enjoy. Kristen-Paige, thank you so much for stopping by Bibliophilia, Please! Please tell us a little bit about your debut novel, Fingerprints of You, in your own words. Fingerprints of You is about that bizarre but beautiful phase in life when you realize the world is much larger than you thought, and that you have the ability to decide what kind of person you want to become. It’s about a pregnant teenager and the cross-country road trip she takes in search of her father, a man she’s never met. It’s set on the road and amidst the inspiring music and art scene in San Francisco, and the book explores the challenges of growing up in a single-parent home and the various ways we can confront our pasts, our skeletons in the closet. But at the heart of it, Fingerprints of You is about the comfort we find in one another and the security of family; not blood-born family necessarily, but the families we create for ourselves from the people we love and the people that love us back. The book is about a seventeen-year-old named Lemon Williams and her discovery of hope and strength as she stands on the brink of adulthood. How did the novel begin? Were there any specific inspirations that began forming the story in your mind? Fingerprints of You began with the central characters, and I first imagined Lemon and Stella when I was living in San Francisco just after finishing my MFA. I liked to work in coffee shops in the city, and one afternoon I spotted a woman and a teenager crossing Fillmore Street in front of the cafe where I was writing. They immediately became Lemon and Stella: a feisty mother-daughter duo in the mist of that strange period of time when the child is becoming an adult and the parent is becoming, in the eyes of the child, an individual or person outside of their parent role. A good portion of the book is about Lemon's realization that her mother has a complicated past, a history that has informed every decision she has made for the two of them, and the novel, in part, began with that idea. Our mothers have not always been mothers, and as children that realization can be startling. I was inspired by the mother-daughter relationship, but particularly by the relationship between a child and a singe-parent. Stella became pregnant when she was still very young and, as expected, not prepared for that sort of situation. And Lemon has never met her father; Stella managed to keep any information about him a secret, so the consequences of that decision were intriguing to me. Exploring that void and the affects of it on Lemon's relationship with her mother was one of the primary seeds of the book. San Francisco was always a central source of inspiration. I lived there for over three years, and I wanted to pay tribute to the rich art and music culture there. In a way, Fingerprints of You is a love letter to San Francisco, it's a thank-you note for the ways it shaped and changed me. Since the novel begins in a tattoo parlor, I have to ask – do you have any tattoos? What was the road to publication like for you and your novel? It’s funny, I’ve been writing for as long as I can remember… I have my MFA, I’ve attended writing conferences and workshops, I’ve read countless books about the publishing industry, and a lot of my friends are published authors, but no matter how much you think you know, there’s just no way to understand the process until you go through it yourself. This interview is taking place exactly 4 weeks before my pub date, and I can honestly say that as wonderful and strange and emotional as the process has been, I honestly have no complaints. Not one. From my agent to my editor to my publicity team at Simon & Schuster, everyone that has been involved in the release of Fingerprints of You has been one hundred percent professional and determined to support the book as much as they possibly can. Publishers are in the business because they love books, and it’s easy to forget that sometimes when you’re collecting rejection letters and reading heartbreaking stories about authors who get orphaned or novels that get lost in big houses. But my experience has been nothing but positive. I’ve been working with my agent for some time now (she originally took me on as a client based off another book I wrote, a novel that has yet to be published), and we work incredibly well together. When the Fingerprints of You manuscript was ready for submission, we emailed and talked on the phone and eventually chose six editors to send it to, and S&S BFYR were part of that original six. I know that makes the sale sound easy, but it wasn’t. Editors have to pitch a submission to a number of different departments (sales, marketing, etc.) and they have convince rooms full of people that your book is worth the purchase before they can make an offer, so there was a lot of waiting involved. And of course selling the book is only the first step in an extremely long process! We sold the manuscript in September 2010, and here it is coming out in August 2012, almost 2 years later. But it really can’t be rushed because each step is unbelievably important – editing, copy editing, proofing, finalizing the book cover, receiving blurbs… I leaned so much with each step, and the book is so much stronger because of all the work we all put into it. I was amazed by how many people were involved and so very grateful for their help and support. When you first write a book you don't think about anybody reading it, at least I didn’t. I was writing for other reasons, so the idea of teens versus adults, it just didn’t cross my mind during the writing process. But I was ridiculously fortunate and found a strong supporter in Judy Blume early in the writing of Fingerprints of You. She found my work through a short story contest in 2008, a blind submission, and she became a kind of long-distance mentor for me while I was working on the book in terms of encouraging me during those periods of time that I struggled. She read a number of different things that I was working on back then and noticed I was writing these gritty teen characters, and she was the first person that mentioned the idea YA might be a good fit for my work. But it was fairly early, and I didn't really think that much about it. Later, after my agent had seen the book a handful of times and we were working on prepping it for submission, I remembered what Judy said. So I started reading the books and was blown away by how smart and powerful YA novels are. John Green, Deb Caletti, Jay Asher, Laurie Halse Anderson… I was amazed by the high-caliber of writing and by the community of readers and authors involved in the genre. I think YA demands a specific kind of energy, a sense of urgency and immediacy. Teen readers won't wait out a slow beginning - they must be engaged from the first page. They won't hang around to see if the novel gets good in the fifth chapter - they'll simply shut the book and tell their friends not to bother. And I love that. They demand a great deal from the author, as they should, and for that reason I find the books to be full of life. But my agent and I had a hard time deciding if Fingerprints of You was a YA book because YA just isn’t clearly defined right now. Which is one of the things I love about the genre. I think that’s what makes it such exciting place to be. So in the end, we decided to send the book to both - to YA and adult divisions. We wanted to keep the doors open. Simon & Schuster Books for Young Readers was the first offer we got, and there was no doubt in my mind that my editor was the perfect person for the book. Writers must overcome so many obstacles, whether they are writing professionally or academically. Who or what inspired you to keep working? A lot of people will tell you "no" along the way, rejection is inevitably a large part of the process, so you have to be doing it for you, not for them. If you're writing because you're happiest when writing, then you're in good shape. I know by now that I’m a much a happier person when I’m writing - I’m more calm, more fulfilled, more confident in my day-to-day life - so stopping just never crossed my mind. I can’t imagine that it ever will, and trust me, I’m still collecting rejection letters! My parents have always been a huge inspiration in terms of taking that leap of faith, of doing what makes me happiest versus doing what’s safest in terms of a career path. And Judy Blume – she’s been a huge inspiration these last years. Whenever I wasn’t writing well or felt like I wasn’t succeeding as quickly as I wanted, I got in touch with her. And she always told me the same thing: I was doing what I was supposed to be doing, hands down, regardless of the good news or the bad news filling up my in-box, I was meant to keep writing. Kristen-Paige, it was a pleasure having you on the blog today. In closing, could you tell us what you would you like readers (especially teens) to take away from reading Fingerprints of You? I hope readers leave the book with a greater awareness of the impact we can make on one another. It goes back to the title – we don’t always know that we’re doing it, but we leave marks on one another all the time. The interaction may seem small or insignificant when it happens, but we often affect one another in ways we’re not always aware of. It may be a quick conversation on a bus or a handful of weeks working together, a shared concert experience or a brief moment in a restaurant… we don’t always know that we’re doing it, but we can affect one another in monumental ways. I hope readers leave the book inspired by that idea: we’re constantly impacting the people around us – the people that pass in and out of our lives – we’re all connected. The exchanges we have may seem small, but can often be more powerful than we know. That, and I hope readers are entertained. I hope they fall in love with these characters as much as I did. Fingerprints of You will be available everywhere tomorrow, but you can order online it today! 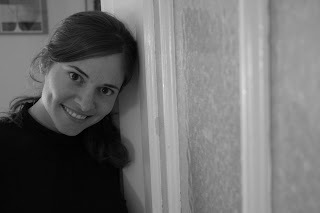 Kristen-Paige Madonia’s debut novel, Fingerprints of You, will be published August 2012 by Simon & Schuster and recent fiction can be found in Upstreet, New Orleans Review, American Fiction: Best Previously Unpublished Stories by Emerging Writers, and Sycamore Review. She was awarded a 2011 Sewanee Writers’ Conference Tennessee Williams Scholarship and has received fellowships from the Vermont Studio Center, the Juniper Summer Writing Institute, Virginia Center for Creative Arts, Hedgebrook, and the Millay Colony. She currently lives in Charlottesville, VA, where she is at work on her second novel. You can keep up with Kristen-Paige on her Website, Twitter, Facebook, and Goodreads. Be sure to stop back by the blog tomorrow to enter to win a copy of Fingerprints of You! Teeheee, I found a typo. Tittle. Oh boy, I am way too immature, because I keep giggling. One of my friends works at an academic library, and one of the foreign professors always says tittles instead of titles in emails. Oh so funny. Oh poo! That's probably my fault. *snickers* On to the fixaroo! I have the Deathly Hallows symbol behind my ear. Surrounding it are the little stars that surround the page numbers from the books. The stars lead down to a quote and are spattered around the quote on my shoulder blade. I CANNOT wait to read this book! I featured it a couple weeks back in my "waiting on Wednesday" post. Love the interview! I actually have heard a little about the book, but never actually looked into it *shuffles feet* It's always cool to have an author interview, and I always end up a bit starstruck, like "Is this what book bloggers get to do?" Following up the last few comments, I myself haven't gotten any tattoos yet, and don't know if I will get any for the time being. Back to the book: the blurb is so good I can't find words for it. Personally, I read a lot of fantasy and sci-fi, but the occasional 'soul food' (I don't know how to describe it) is always good. I am really looking forward to reading Fingerprints Of You. As for a tattoo, I'd love to have stars tattlooed on my wrist and something Harry Potter related as well, maybe a snitch! Thanks for the great interview ;) I am sooo excited to read Fingerprints of You! The cover is so gorgeous and it's sounds AMAZING. I feel like if I had an awesome custom design like that on my first published book cover, that would be the only way I could be tempted to get a tattoo. I would probably go for the bird or flowers, though, rather than the title. However, I greatly fear needles and pain, so no tattoos for me. Also, I don't have a book. I can't wait to read this book. It's been on my radar for a couple weeks now. It sounds awesome. I have a couple tats. One is based on a book, but it's kind of obscure and slightly embarrassing. And another is a band tat that is way more obscure and far more embarrassing. But I love them both, as crazy as that sounds. I enjoyed the interview and the tattoo question. I love Fingerprints of You's cover, is just amazing! Great interview, thanks!